Thank you to Eric Bergman RN, CCM, President of the Case Management Society of America-Chicago (CMSA), for including the National Nurse Act in his opening remarks during the annual conference of the Illinois state affiliate of CMSA. The campaign for a National Nurse for Public Health is led by an all-volunteer board and advocacy team- in fact, many who serve on the NNNO Advocacy team are also members of CMSA. The National Nurse Act is cost neutral, asking that the Chief Nurse Officer (CNO) of Public Health Service (PHS) to be designated as the National Nurse for Public Health. Now more than ever, nurses have a responsibility to promote prevention, help improve outcomes, and guide local, state, and national initiatives to address our most pressing and challenging health problems. 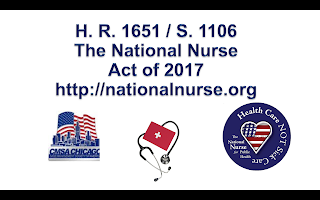 The National Nurse Act highlights the important work nurses and case managers perform every day to promote health in our country.